In its decision this week in Perry v. Aiello, the Massachusetts Appeals Court addresses an interesting question: whether a 1947 grant of easement-like rights created an affirmative easement, which can be perpetual, or a disfavored restriction whose duration is limited by sections 26-30 of M.G.L. c. 184. 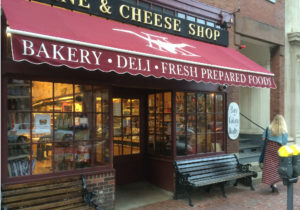 The case involved a dispute between two storied Boston institutions: DeLuca’s Market, a high-end grocery store that’s been in the same spot at the foot of Beacon Hill for over 100 years, and King’s Chapel, which dates back a bit further – as in 1686. DeLuca’s, King’s Chapel, and another abutter share the use of a ten-foot-wide passageway between their buildings (the King’s Chapel building is a nice old brownstone, not the historic chapel itself, which is across town). Fee ownership of the passageway is divided in half, with the abutters on each side owning to the center line. In 2013, the parties’ dispute over the passageway came to a head, and King’s Chapel and the other abutter sought a declaratory judgment. The trial court parsed the 1947 agreement and determined that it created both an affirmative easement and a restriction: a “restated” easement allowing the owner of the DeLuca’s property to use the half of the passageway owned by King’s Chapel and the other abutter for travel on foot and with hand carts, and a restriction (with the same terms) applicable to the half of the passageway owned by DeLuca’s. Because a restriction of this vintage expires after 50 years, whereas an affirmative easement can be perpetual, the trial court ruled that DeLuca’s could use its half of the passageway for any purpose not inconsistent with the other parties’ rights, but could only use the other half of the passageway for travel on foot and with hand carts. The Appeals Court reversed this aspect of the trial court’s decision. Regarding easements and restrictions, the court observed, “[t]he difference is not always readily apparent, and the distinction [can be] outcome determinative . . . .” The Appeals Court found that the trial court’s differing treatment of the two sides of the passageway wasn’t warranted because no such distinction was made in the 1947 agreement. As to whether the agreement created an affirmative easement benefiting the DeLuca’s property, the court found it didn’t since it “gave the DeLuca’s defendants’ predecessors nothing that they did not already have,” by which the court meant that, in the absence of the agreement, DeLuca’s’ predecessors had an unrestricted right to use the whole passageway. Viewed in this light, the only material effect of the agreement was to restrict the predecessors’ easement rights in the side of the passageway they didn’t own. Turning to M.G.L. c. 184, §§ 26-30, the court found that a restriction on easement rights falls well within the broad concept of “restriction” as used in the statute. Because this restriction expired after 50 years, DeLuca’s is free to use the whole passageway for all purposes for which streets or ways are commonly used (except, as described at pages 10-11 of the decision, parking).